Live coverage of the 73rd Golden Globe Awards! It's a wrap! We hope you enjoyed our live coverage. See you at the next one! ICYMI: Catch the ceremony tonight at 21:30 on M-Net (Dstv 101). WINNER: The Revenant best motion picture drama. This is the third award the film has won this evening! It's down to the final award of the night, best motion picture drama. WINNER: Leonardo DiCaprio best actor in a motion picture drama, The Revenant. Leo gets a standing ovation from the crowd! WINNER: Brie Larson best actress motion picture drama, Room. Denzel and his family on stage. Hello, Denzel's son and Ballers star, John! WINNER: The Martian best motion picture comedy. Two time Golden Globe winner Jim Carey on stage now. Tobey Maguire introduces best picture nominee, The Revenant. Another best moment, Gaga and Leo got them cookies too! Maggie Gyllenhaal introduces best picture nominee, Room. WINNER: Jennifer Lawrence best actress in a motion picture comedy, Joy. WINNER: Taraji. P Henson best actress in a TV series drama, Empire. This is her first win and nomination for her role as Cookie. WINNER: Alejandro González Iñárritu best director, The Revenant. Chris Evans on stage introducing best picture nominee, Spotlight. 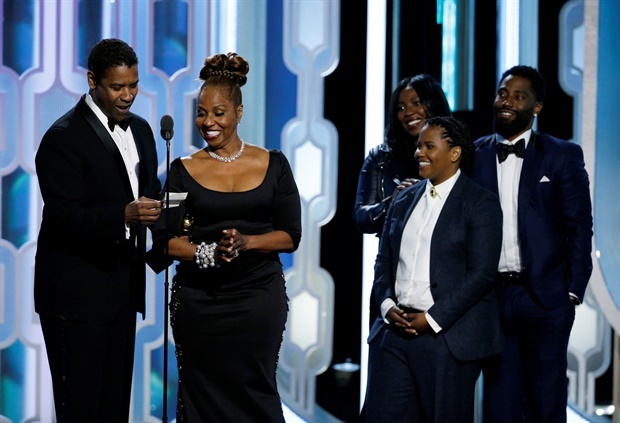 Denzel Washington brings his family on stage with him to accept the award. A new House of Cards trailer just premiered during the Golden Globes broadcast. Sidenote: Meet Sylvester Stallone's daughters. Tom Hanks on stage now to present Denzel Washington with the Cecil B. DeMille Award. 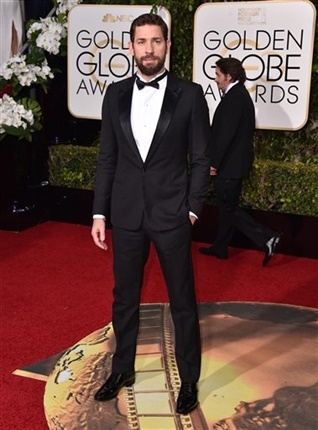 Shout out to John Krasinski's beard! WINNER: Mr Robot best TV drama series. Mel Gibson introduces best picture nominee Mad Max: Fury Road. WINNER: Sam Smith and Jimmy Napes best original song, motion picture, The Writings on the Wall, Spectre. 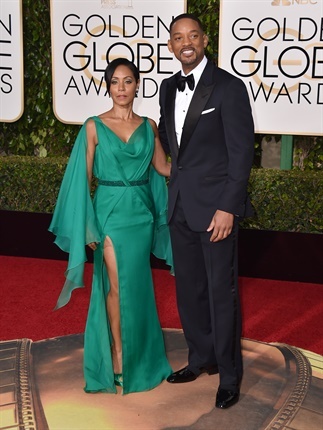 It was all glitz and glam as celebs walked the red carpet at the 73rd annual Golden Globe Awards. WINNER: Lady Gaga best actress in a limited series or TV movie, American Horror Story: Hotel. This is her first win and nomination! WINNER: Son of Saul, Hungary best foreign language film. Catching up on some reading, Aziz? WINNER: Gael Garcia Bernal best actor in a TV series, comedy, Mozart in The Jungle. This is his first win and nomination! WINNER: Aaron Sorkin best screenplay motion picture, Steve Jobs. Comic duo Mark Wahlberg and Will Ferrell on stage! This is Sylvester Stallone's first Golden Globe win! This was our reaction too! Sylvester thanks his imaginary friend, Rocky Balboa for being the best friend he's ever had. WINNER: Sylvester Stallone best supporting action in a motion picture, Creed. Syl gets a standing ovation from the crowd! Hollywood hunks Ryan Gosling and Brad Pitt on stage to introduce The Big Short. WINNER: Inside Out, best animated picture. Matt, back after 18 years.